Some ideas make so much sense that you slap your head and say, "Why didn't I think of that? " Proposals have been thrown around for decades about electrifying our roadways to light them up, melt ice, or even to power our cars. But the sheer size of the task makes it prohibitively expensive. There are around four million miles of paved roads in America. 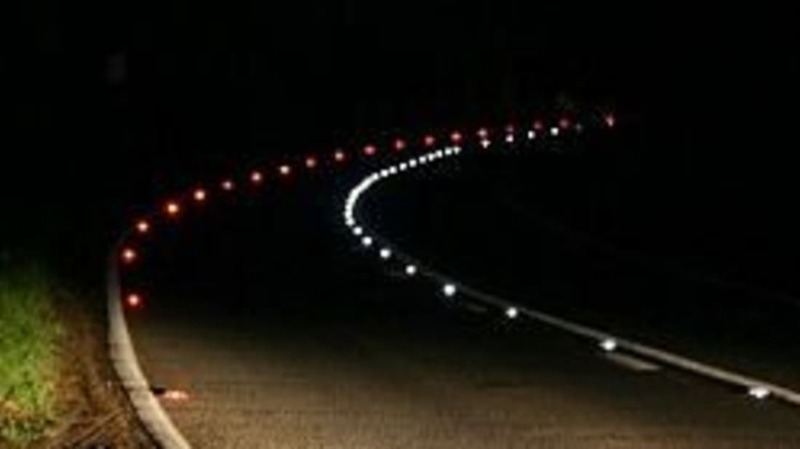 Astucia Traffic Safety Systems developed SolarLite road studs to illuminate roadways without a power grid. Each stud contains its own solar collector and LED light, plus a microprocessor that manages power so that two hours of sunshine gives them enough power to illuminate for ten days. The result is road visibility up to a kilometer ahead -ten times further than headlights can reach reflectors, even in bad weather. They come in both raised and flush styles with a variety of colors. This technology, in use in Europe for years, will soon be coming to America. So are they making a difference? Currently the SolarLite studs have been installed in over 120 location across the UK, Netherlands, France, Australia and South Africa. Local authorities in places where the road studs have been installed reported a 70 percent reduction in accidents occuring in night time. Automotoportal has some statistics on increased road safety in the countries that employ the studs. The latest generation of "smart" studs can also be controlled remotely by traffic control systems. During rush hour, lights can be illuminated to indicate open lanes, or to warn of accidents or congestion ahead. Strings of hardwired studs can flash in sequence, showing the direction of traffic. Testing in the Netherlands and in Scotland so far shows great promise for the system.